Sorry, Joyetech eGo ONE XL clearomizer has been discontinued. 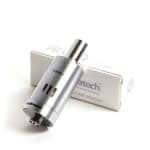 Replacement tank for your Joyetech eGo ONE XL and eGo ONE kit, or any 510 threaded battery capable of reading 0.5 or 1.0 ohm coils. If you need to replace the original, or just want to have an additional clearomizer for your Joyetech eGo ONE XL Kit, this clearomizer will do the trick. It has a 2.5ml capacity, same as the one that comes in the XL kit, but will also fit the standard eGo ONE kit, and any 510 thread battery that can read its 0.5, or 1ohm coils. HOLY this thing is really, really, really awesome! This thing produces vapor as big or bigger than any other sub-tank or atlantis! The secret seems to be the adjustable juice flow setting on the coil! Very pleased with this suggestion from the staff at the Yonge store! THANKS!